The Blossom Menstrual Cup is one of the most popular menstrual cups in the world. The main thing that people love is that it’s a bit cheaper than some of the more established menstrual cup brands. But, is the quality the same? Most people think so! The Blossom Period Cup has thousands of excellent customer reviews over on Amazon. Check out our 10 quick facts about the Blossom Cup. Or, head on over to our full review to find out the detailed information that’s help you decide whether it’s a buy. If you’re looking to go green for your period, then you’ll need to consider the Blossom Menstrual Cup. The average person uses 11,000-16,000 tampons during the course of a lifetime. Compare this to the Blossom Menstrual Cup, which most people find lasts for around 5 years. If the average person menstruates for 40 years, that’s 8 cups vs. thousands of tampons. It’s clear what the best option for the environment is! 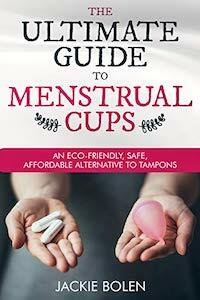 We’re all about zero-waste and a menstrual cup is one easy way to get there. The best menstrual cups in the world are made in North America or Europe. These companies use top-quality materials, and manufacturing standards are high. The Blossom Cup is no exception. It’s made in the USA and is comparable to some of the highest-quality cups you can buy. There are two sizes of Blossom Period Cup: small and large. The small is for those who haven’t given birth vaginally, while the large is for people who have. In terms of sizing, it’s a bit shorter, and has a bit smaller capacity than the average menstrual cup like the Diva Cup. There are a few companies out there that offer a money-back guarantee (the Saalt Cup for examples has a 2-cycle return policy). The Blossom Cup is one of them. Tampons are expensive! Although the Blossom Cup does cost a bit more money up-front, you’ll recoup your costs in a matter of months. After that? It’s years of a “free” period protection. Seriously. You can save thousands of dollars over a lifetime by making the switch from tampons to a menstrual cup. If you take basic precautions (changing your tampon frequently enough), the risk of Toxic Shock Syndrome from tampons isn’t high. However, there are still hundreds of people who do get it every year. Compare this to menstrual cup. To date, there is one recorded case. It’s clear that the risk of TSS is lower with the Blossom Period Cup than with tampons. Most menstrual cups are made from silicone. The best ones are made from materials that are medical grade, while the cheap cups are made from sub-par materials. What about the Blossom Cup? It’s made from medical grade silicone that is imported from Germany. The Blossom Cup is considered to be a softer menstrual cup, when compared to something like the Diva Cup. Some people prefer firmer cups because they’re easy to insert. They just pop open. Others like soft menstrual cups because they feel more comfortable when inside. Amazon is the go-to place to look at online reviews of menstrual cups. The best menstrual cup brands like the Diva Cup, Moon Cup, Lunette Cup, or Lena Cup have thousands of 5-star reviews. In general, the best menstrual cups that you should actually consider buying have 500+ reviews, with an overall ratings of around 4.3/5 or higher. What about the Blossom Menstrual Cup? They have 5000+ reviews with an excellent overall rating. Clearly there are many satisfied customers. One common mistake that people make with this menstrual cup is to insert it too high in the vaginal canal. It’s designed to sit very low, just so that the stem isn’t sticking out. You’ll find it easier to insert and remove if you do this. It’ll also be more comfortable. Blossom Menstrual Cup Facts: Have your Say! What do you think about these Blossom Cup facts? Leave a comment below and share your thoughts with us!